A fresh, earthy fragrance from a surprising source. Cannabis perfume is safe and all-natural. At its foundation are aromatic terpenes found in the plant. These essential oils are thought to help improve mood and reduce stress. Other oils like fir needle, lemon, and lavender are blended in to create a musky scent with notes of cedar and sandalwood. Made in the USA. 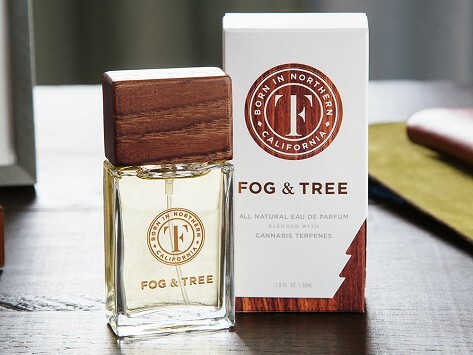 Dimensions: 1.75" x 3.5" x 1"
Cannabis cologne might sound offbeat, but the eau de parfum from Fog & Tree is a woodsy, fresh scent that is natural and safe and it doesn’t smell like you might think. It’s made from terpenes, natural essential oils found in the cannabis plant. These aromatic oils seemed like the perfect foundation for a fragrance to founder Elizabeth Kost. She and the Fog & Tree team created the first all-natural fragrance with real terpenes. Besides smelling great, terpenes are thought to boost your mood and help you destress, like some of the more common essential oils. The earthy terpenes are blended with other essential oils like fir needle, lemon, and lavender to evoke the lush forests of Northern California, where the cannabis is grown. You’ll get notes of cedar and sandalwood, but no weed-like scent. This fresh and natural fragrance sounds (and smells) great to us.